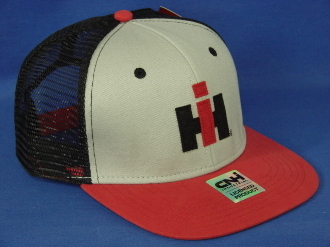 International Harvester, Red Flat Bill, Grey Front and Black Mesh Back Cap. 6 Panel Mid-Profile Structured Cap. Classic IH Logo Made Of Felt And Sewn On. Red Snap Closure.